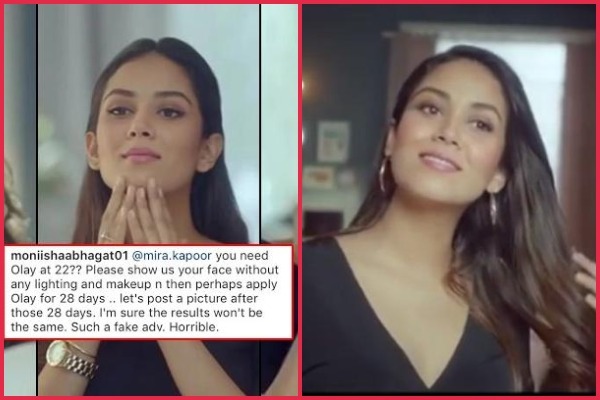 Shahid Kapoor’s Wife Mira Rajput Trolled For Endorsing An Anti-Ageing Product At 23! Ever since Shahid Kapoor got married to a Delhi based girl Mira Rajput, rumours of his much younger pretty wife making her Bollywood debut have been circulating. While the couple has made it clear that that Mira will not be starring in any Bollywood project in near future— soon to be mother of two made her debut though a television commercial for an anti-ageing product. While hubby Shahid Kapoor is calling his wife a stunner, Mira Rajput Kapoor is being trolled mercilessly. Trending: Shahid Kapoor Hosts A Baby Shower For Wife Mira Rajput Kapoor; See Inside Pictures! Naturally to remedy this Mira started using the anti-ageing product before her daughter Misha Kapoor’s first birthday and soon noticed the difference. Mira concluded the advertisement by stating that she is about to be a mother for the second time and she’s ready for the challenges it brings along. Shahid Kapoor And Mira Rajput Buy Relief Worth 56 Cr From Prostitution Menace! As soon as the commercial was unveiled Shahid Kapoor wasted no time in calling his wife a stunner in the comments section. However, most of the general masses are not happy. Many trolls have collectively voiced that there was no need for a young woman of mere 23 years of age to endorse an anti-ageing product. While other comments were about Mira Kapoor’s lack of acting skills and exaggerated expressions. In the meanwhile, Mira Rajput Kapoor is not the only celebrity to have made her debut through a commercial. Amitabh Bachchan’s daughter Shweta Bachchan Nanda made her debut though a commercial for a jewellery brand alongside her father. The advertisement was soon pulled back due to incorrect representation of the banking community. While Mira Rajput Kapoor’s commercial debut will likely not be pulled back but was it necessary for a young woman to endorse an anti-ageing product? Previous : Shah Rukh Khan’s Witty Response To Priyanka Chopra’s Engagement Is Winning The Internet!